May 16, 2016 | 4 p.m. 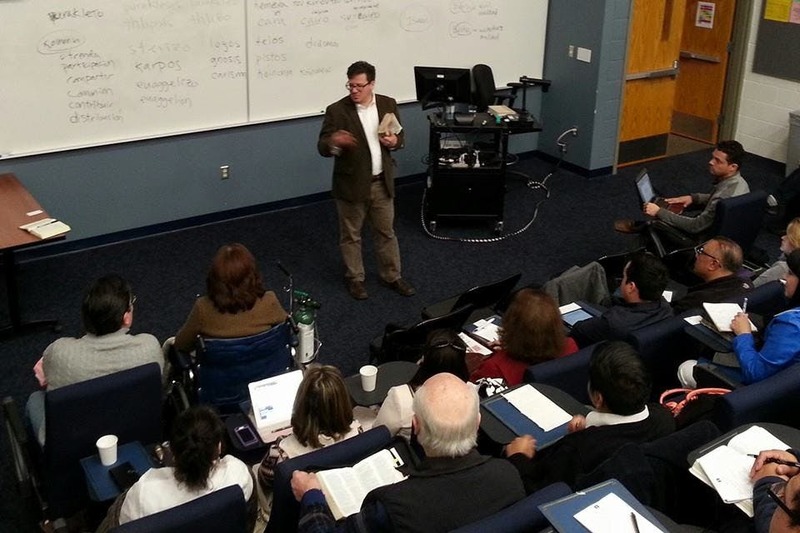 Professor of Biblical and Theological Studies Juan Hernández Jr. led a half-day seminar on the epistles in Spanish. Bethel’s Office of Church Relations recently sponsored a biblical teaching seminar specifically for Spanish-speaking pastors and ministry leaders. Nearly 150 pastors and ministry leaders from churches around the state of Minnesota gathered for a full morning of instruction on biblical teaching in their first language, Spanish. Professor of Biblical Studies Juan Hernández Jr. in the College of Arts & Sciences led the seminar. Hernández , a Greek and New Testament scholar, focused his instruction on the historical and literary contexts of each New Testament epistle, as well as the theological and ministerial teachings of each. The seminar was deemed successful, selling out to pastors and leaders throughout the state. Many represented churches and ministries from the Twin Cities metro area, but also included attendees from as far as Sauk Centre, Faribault, and Rochester, all in Minnesota. “We were thrilled with the turnout and with the opportunity to fellowship with this particular community,” says Hernández. “The success of the event underscores both the great need and the great hunger for theological education among Hispanic leaders and pastors in the Twin Cities area." Last fall, the Rev. Samuel Rodriguez, president of the National Hispanic Christian Leadership Conference, spoke at Chapel at Bethel. During his visit to campus, he had conversations with Bethel’s Executive Minister for Church Relations Ralph Gustafson that spurred about leveraging Bethel’s connections and resources to serve Hispanic church leaders. This was the first in a series of events for Hispanic and Spanish-speaking church leaders. Gustafson and the Office of Church Relations are planning the second seminar to take place in early summer.